I don’t know much about wine. Perhaps that’s why I enjoy reading the Saturday wine columns in the Wall Street Journal. I considered it a major calamity when the wife-and-husband team of Dorothy J. Gaiter and John Brecher were dropped without explanation at the end of 2009, but I’ve since grown accustomed to their alternating replacements, Lettie Teague and Jay McInerney. Soon I will be taking my leave of them. They’re not going anywhere; I am. I have decided to stop taking the WSJ once my current one-year commitment comes to an end. Why? Rupert Murdoch. Need I say more? I can’t stomach contributing to his enterprise. Yes, I know. That means I should also stop watching any and all shows on FOX television. And avoid all other Murdoch-based intrusions on my life. Maybe I will. One step at a time. And the first step is, no more WSJ. It’s not like I read all that much in the WSJ anyway. I try to remember to look at the daily book reviews. Once a week, this is a problem, since the book review occupies the same page as some of the op-ed contributions, and that one day a week I need to avoid letting my eyes fall on the column by, well, I dare not say his name. That man of evil who is an anagram of Vorr Lake. Not that there is a Vorr Lake, but that’s the best anagram I could come up with. Maybe you can do better. I look at the sports coverage, the arts and culture coverage. On Fridays, there’s the Friday Journal, a culture section. On Saturdays, another weekly culture section was recently expanded and split in two, resulting in what’s now called Review and Off Duty. I have to say, I will miss them. I think they are extremely well done. I always make it a point to read the contributions of Dan Neil, the automotive columnist and a fine writer. Terry Teachout always has informative pieces on regional theater throughout the US. And then there are Lettie and Jay. The wine world is rife with clichés (wines are “made in the vineyard” or “express a terroir”), but the most persistent cliché is that Italian wines go well with food—perhaps better than any other wines in the world. Is it possible that this is one cliché that might actually be true? There are several reasons why I think it could. First of all, the Italians put the two together quite often, perhaps more often than anyone else. Wine is an important, even inevitable, part of an Italian meal. Follow the link to see what she suggests. 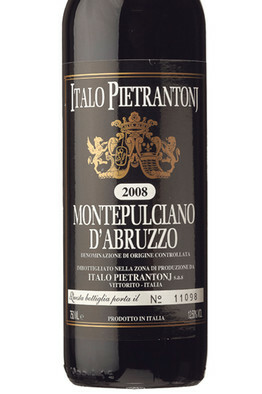 There’s a Montepulciano d’Abruzzo for just $11 that I’m thinking we should add to our cellar, since we’re always happy to drink Montepulciano. Wines aside, you might enjoy the accompanying slide show from around Italy. Ciao, Lettie. Ciao, WSJ. I wish things could have been different.